Lisbon is still mentioned today as the "city of 7 hills" but has, after all, 8 hills. The 8th hill of Lisbon is the hill of the Graça district, which is continuous to the Castle Hill - the highest hill of Lisbon and that "hides" this 8th hill. Anybody that’s walked up there will know. Saint Anthony is Lisbon’s most popular but, in fact, Lisbon’s patron saint is ... Saint Vincent! In fact, the city’s coat of arms is linked to this saint, original of Saragossa, and symbolizes the Christian conquest of Lisbon to the Moors in 1147. 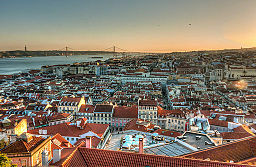 Did you know that Lisbon is Europe’s second oldest capital (1200BC)? No surprise it is so rich in history and has so many stories to tell. 4.Did you know that the Lisboners are known as Alfacinhas (literally little lettuces)? Alface” (or lettuce) comes from the Arabic (Al-Hassa).The origin of this designation is a bit uncertain, though. There are those who explain that in the hills of primitive Lisbon, lettuce was planted as a "horticultural plant used in cooking, perfumery and medicine." This may indicate that the cultivation of the plant began during the occupation of the Iberian Peninsula by the Moors. 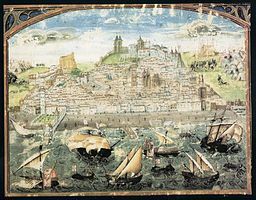 There are also those who defend that, in one of the sieges of the city, the inhabitants of the Portuguese capital had almost exclusively the lettuce of their gardens as their main source of food. 5.Forget Ulisses’ myth, Lisbon’s name has Phoenician origin. It seems like the most possible theory for the origin of the name “Lisboa” is linked to the Phoenicians, that attributed to the city the name Allis Ubbo - meaning pleasant little bay. This theory is a lot less fascinating than another possible theory about the city’s name that was aired in the 15th and 16th century: stating that Ulysses, the ancient Greek hero, had given the city its name. Lisbon has been inhabited by various peoples, pre-Celts and Celts during the Iron age, Greeks, Phoenicians, Carthaginians, Romans, Sevens, Visigoths, Moors and Christians. 7.The most emblematic transport in Lisbon is actually American. Now an essential part of Lisbon's life, the iconic tram 28 is, actually, of American origin. It was inaugurated in 1914 and today it has a 7km (4.5 miles) route between Martim Moniz Square and the neighbourhood of Prazeres in Campo de Ourique. It’s the best way to squeeze through the narrow streets and corners of the older districts. Did you know that the famous Custard Tarts are made after an ancient ‘secret recipe' from the Saint Jerome Monastery? To discover more curiosities, the history and stories of Lisbon book here your personalized visit of the city. Lisbon with Pats Trailer from Patrícia Madeira on Vimeo.